Understanding the connections between a mother’s health and that of her newborn is crucial for addressing maternal and infant mortality and morbidity. The majority of maternal and infant deaths occur during pregnancy, childbirth or the immediate postpartum period, most of which are preventable. Ensuring that mothers and babies receive timely, high quality care during these critical periods is essential. Antenatal care, for example, provides an opportunity to screen for, prevent and treat pre-eclampsia/eclampsia, preterm delivery and other complications that can be life-threatening to both mother and baby. Particularly in areas most affected by the HIV/AIDS epidemic, patient education and appropriate treatment during pregnancy, childbirth and the postpartum period is necessary to prevent mother-to-child transmission of HIV. Helping women to deliver safely with skilled birth attendants and the necessary supplies is another key to preventing the leading causes of maternal and newborn deaths including hemorrhage and infection. Access to high quality data is one of the greatest challenges to improving maternal and newborn health. In countries with poor health information systems, data on stillbirths and neonatal deaths often are not collected or analyzed. Furthermore, even if mortality data for mothers and infants are collected, those data often are not linked to one another, which limits researchers’ ability to understand how maternal complications may have been related to an infant’s death. Making these connections is a critical first step towards ending preventable stillbirths and maternal and newborn deaths. 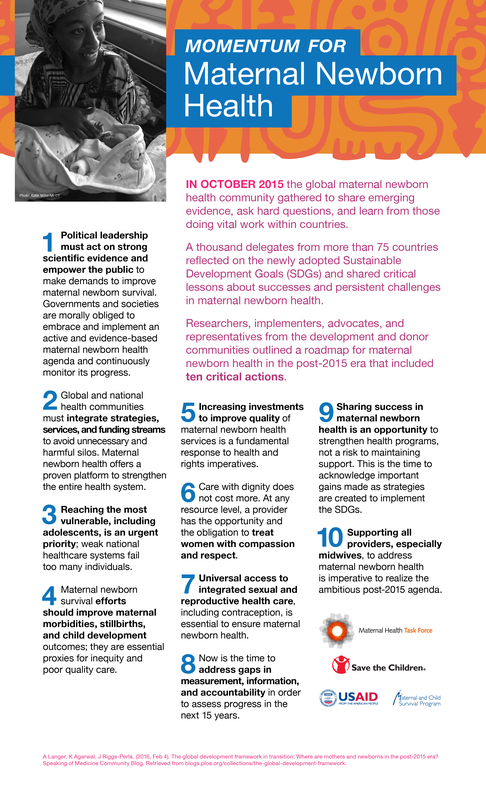 Following the Global Maternal Newborn Health Conference in 2015, the MHTF released an infographic outlining ten critical actions. In 2014, the MHTF launched its third collection with PLOS focused on maternal and newborn health integration. In December 2014, the MHTF Quarterly focused on maternal and newborn health integration. In October 2015, the MHTF collaborated with Save the Children’s Saving Newborn Lives program and USAID’s flagship Maternal and Child Survival Program to host a conference focused on maternal and newborn health integration. In September 2014, the MHTF hosted a technical meeting to discuss maternal newborn health integration and quality of care. In July 2014 as a part of the Advancing Dialogue on Maternal Health Series, the MHTF hosted a panel discussion at the Woodrow Wilson Center focused on nutrition and the maternal newborn continuum of care.